The twin brothers Matthew and Gunnar Nelson say they've pushed themselves to make the best album they possibly could. Gunnar Nelson says: 'We set a pretty high standard with our previous release with Frontiers - Lightning Strikes Twice. 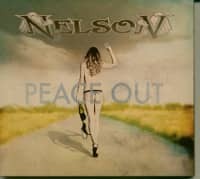 That record received by far the most critical acclaim of any Nelson record to date. Peace Out was expected to be even better, so the goal was to push ourselves to the very limit - past what we believed we could do.' The fourth generation of a musical family that includes grandfather Ozzie Nelson, who was a celebrated big band leader. Their late father Ricky is a member of the Rock And Roll Hall Of Fame and credited with creating country-rock. 09 What's Not to Love? Customer evaluation for "Peace Out (CD)"